Within American politics, there are several parties where citizens can become a part of, usually dependent on their viewpoints. It is said that the two most well-known political parties in American are the Democrats and Republicans. Surprising to some, the two parties are represented by the symbols of a donkey and an elephant (respectively). Initially these animal symbols were used on campaign banners, but over the years they have become two of the most outstanding logos in American politics allowing candidates to introduce their US political logo designs. To understand the true meaning behind these two popular symbols in politics, let’s take a look at the brief history behind these democratic andrepublican logo ideas. We’ll also review how these two animal symbols came to represent the two of the biggest political parties of US. Image Source: Vecteezy/zhaolifangThe Democrats were first to use the donkey as their representative symbol. The donkey represents the Democrats’ beginning 1828. The running President of 1828 was President Andrew Jackson and he was labeled as a “jackass” due to his populist views and stubborn nature. His main slogan was, “Let the people rule.” Although the cartoon was depicted to mock him, it was later adopted by Jackson himself to represent his Democratic party in 1837. 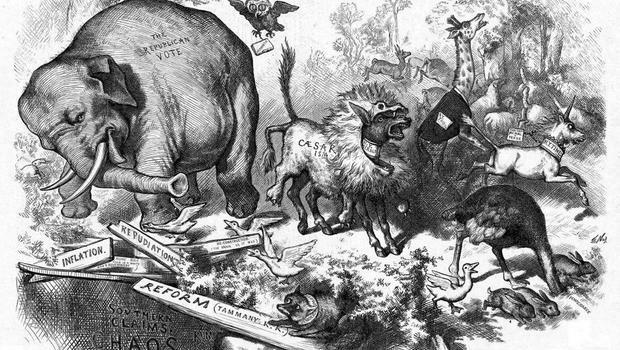 Image Source: Vecteezy/zhaolifangSome believe that being a Republican influenced Thomas Nast on choosing a bull elephant to represent his party. However, the Republican elephant was not as intentional as Jackson’s donkey. It was formed through a series of events involving New York’s two popular magazines, The Herald and The Harper’s Weekly. The Herald once ran a story of zoo animals being let loose and roaming in New York’s Central Park looking for prey. Cartoonist Thomas Nast drew a cartoon of a donkey wearing lion’s skin, chasing away all the animals (given below). This cartoon was a metaphor for President Ulysses S. Grant whom was running for third term presidency and there was a significant amount of conflict in the Democratic Party. This was one reason that the cartoon included a panicked elephant bearing the label, “Republican Vote.” Ever since then, the elephant became the Republican Party’s its main symbol.However such attacks on political campaign branding are not isolated incidents of the past. We witness Republican logo design goof ups today as well. The Democratic donkey represents hard work, diligence, humbleness and a dedication to the USA. The Republicans however, strongly disagree and consider the donkey a symbol of stubbornness. On the other hand, the Republican elephant represents intelligence, dignity and is considered as the symbol of strength (as it is seen as the only animal that stood up to a lion). In contrast to this, the Democrats see the elephant as comparable to a circus animal. Both of these symbols found firm foundation in the growing American pop culture and were copyrighted to represent the two political parties. The political logos have the prominent standardized colors and stars of the American flag. Generally, the Republican elephant logo upholds 3 stars while the Democratic donkey logo design has 4. However, the donkey can also been seen with a variation of 3 stars. Thomas Nast was a political cartoonist, who usually drew satirical cartoons depicting the state of American politics. It was his idea to use the two animals for representing the Democratic and Republican parties. Thomas Nast was born in 1840 and had a great career being a caricaturist, an illustrator and a painter. Apart from the political symbols, he is also well acclaimed for the sketch of fat and jolly Santa Claus carrying gifts for little children (previously, Santa was depicted as skinny). Although the artist died in 1902, his sketches and drawings still live on. There you go! Wasn’t that an interesting history? Let us know what you think of the Republican and Democratic logos. For a presidential candidate, the first impression they give about their campaign is their logo design. From their on-air personality to the tie they wear, politics is loaded with personal branding.The candidate’s goal is to use personal branding to face opponents and grab that party nomination. Without taking sides, let’s take a quick look at the top candidates of each party and see how they measure up over the last 20 years. Which political party does the better job with their logo designs overall? US Presidential Candidate Logo Designs of the Past 20 Years from LogoDesignGuru*This post was originally written by Alexis Stone. Why are the stars in the republican elephant symbol arranged with the one point down while the Democrat symbols have one point pointing straight up? Good observation Terry! There are quite a few interesting theories as to why the stars in both the logos are used in certain way. Initially the stars were used in the logos like they are used in the American flag, with the head pointing upwards. However it is believed that in the beginning the stars were usually had their heads pointing downwards even on the American flag which was later corrected after a regulation order was passed regarding the exact arrangement of the stars and other portions of the flag. Perhaps the Republican logo takes the stars from the initial flag design and maybe it is not intended purposely, although some might differ on this theory. No it was not Bush, when I worked for the GOP in the late 80s the stars were already upside down and could not find answer then or ever since. Anyone know for a fact when or why they were turned??? The official reason given for the stars pointing downwards is that when a ship is in danger and a SOS is shouted the whole American flag must be raised upside down, with the stars pointing downwards, the stars were put upside down in preparation for the War of Terror, a very Satanic concept indeed, based on false flag dangers. Both directions of the stars can be equally malefic. A star pointing upwards means Lucifer as a symbol of excessive pride and ego, a star pointing downwards rather means Satan as a symbol of excessive accusation and guilt, as happen quite often when puritan fundamentalists come into power, as was the case with Reagan and more recently with Bush, Sarah Palin, and Pence. The stars upside down aren’t necessarily satanic, but they could also represent man, as man has 5 digits (naturally) on all appendages, and the tetragrammaton represents man standing, legs spread arms out. The inversion means the perversion of mankind. The inverted stars are just that nothing satanic or distrespectfull about it. It’s a logo NOT our County’s flag. If you read the Respect for the flag, U.S. code title 4 section 8(a) refers to a flag not logo and the stars can in fact be inverted as a sign of dire distress in intances of extreme danger to life or propery. Seems rather fitting to me. How about the stars number: 3 in the Republican logo, while 4 in the Democrat’s? Any reason why? Regarding the stats – if you look around on the internet you’ll see the stars for the GOP both pointing up and down. Idiots will be idiots…. Crooked Hillary still lost. Get over it. Is the democratic logo licensed?